Carney was a once familiar type that is now rare. A learned, scholarly Boston-Irish priest, warm and gregarious and well-connected in academia, to royalty, and to the Vatican, humble and funny and self-effacing, and boisterous and enthusiastic at the same time. He was always ready to lend human support to anyone, regardless of doctrinal niceties. (Peter Gomes once said to me, after Carney had carried out his offices in a kind and generous way as I suspect not every priest in today's Roman Catholic Church would have chosen to do, "Are they still letting him do that?") He served for a time as head of Harvard's Semitic Museum, and after that started the Archives for Historical Documentation, which describes Carney's mission this way: "Since 1963, Carney's research has been dedicated to understanding and preserving the cultural heritage of the Middle East while promoting peace among the region's prevalent faiths through this shared history." "I call it an ‘odyssey,’" says Rev. 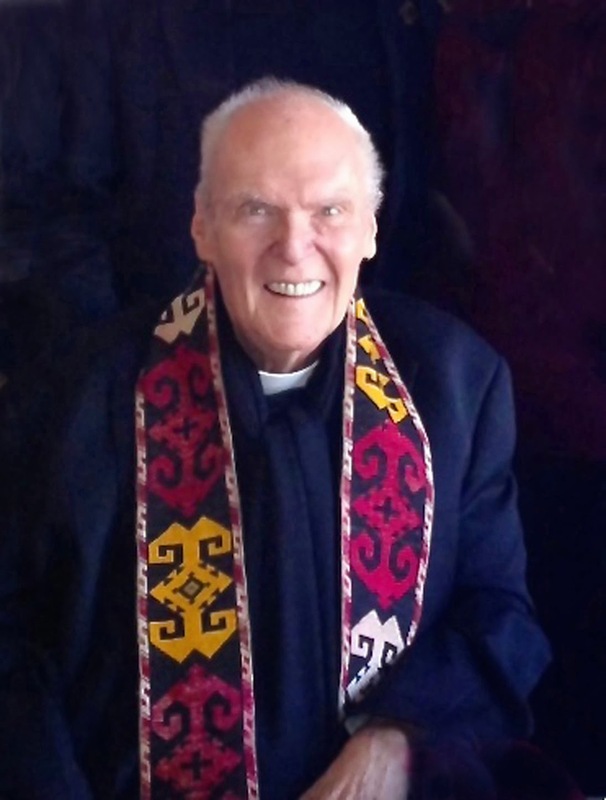 Carney Gavin, Ph.D. ’73, a longtime friend of and pastor to the Mee family at St. Columbkille’s Church in Brighton. "It’s terrible and sad and frightening and filled with all kinds of encounters." Even in this age of dot-com billionaires, he adds, "There’s nobody who doesn’t question, ‘What is heroism? What is worthwhile in life?’ I cannot tell you how heroically Peter has worked to find a meaningful place for himself. It involved horrible, horrible failures and incredible obstacles." Pretty nice description of his own past few years; he never slowed down, traveling to Europe and the Middle east constantly, bringing back vials of water from the River Jordan, lumps of frankincense, and other small gifts for his friends' children, and all the while trying to preserve the history of the Middle East. He was a good man, and I regret his passing. Thanks to his friends at St. Columbkille's for permission to reproduce the photograph above, which was taken very recently. That's him all right, laughing to the end.